Today is the feast day of St Chrodegang, the 8th century Bishop of Metz. Although St Augustine had established a rule of life for clerics at the end of the 4th century, by the middle ages, clergy who lived together (such as in Cathedral Churches) did not, on the whole, choose to abide by it. They were not bound by a rule of life, but they were bound by the usual canons that govern priestly life. After the death of St Boniface, the leadership of the German church fell upon the shoulders of Chrodegang (literally, in the form of a pallium). He was aware that, in order for this nascent church to succeed, he needed priests who were holy – or at least on the way to holiness! – and lived as lamp-stands for Christ, shining brightly in this dark world of ours. He composed a rule for his cathedral clergy, that bound them to the celebration of the sacred liturgy and to prayers in common, to common meals and dormitory, to public penance and to rigorous formation. He permitted, however, his clergy to retain the right to own property, and to maintain other independent incomes. This was of life was, 50 years after his death, extended to all clergy in the empire (the updated rule was known as the Rule of Aachen, after the synod that mandated its implementation) that lived in common, thus creating secular canonries. 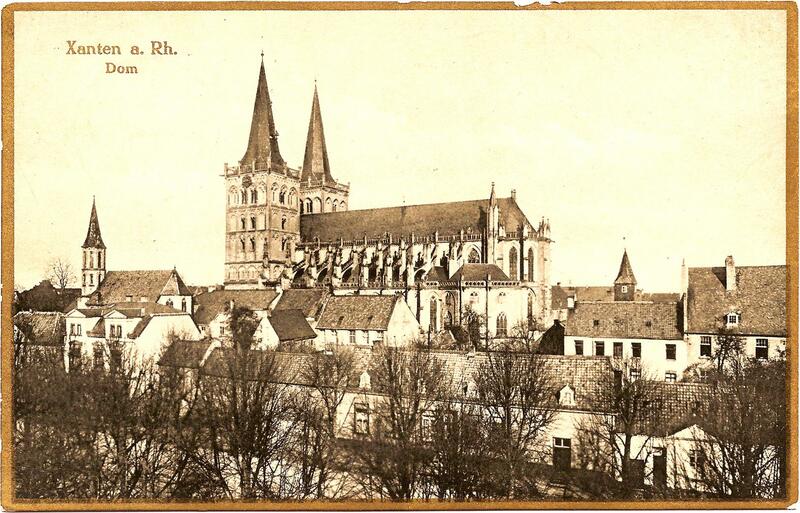 The Collegiate Church of St Victor, Xanten. It was this Rule of Aachen that governed the secular clergy of the Xantener Dom, where St Norbert received his formation as a Canon of St Victor; after his conversion, 900 years ago this year, he returned to Xanten and unsuccessfully tried to convince them to live a religious life, and eschew the private property that Chrodegang had historically permitted canons to have. It was St Norbert, however, and not the Canons of Xanten that was thinking with the Church. The Gregorian Reforms of the eleventh-century had encouraged the adoption of this way of life. There was a great revival of the original Augustinian way of life, crowned, of course, by the presentation of the rule by Augustine himself to Norbert at Prémontré. They devoted themselves to the apostles’ teaching and fellowship, to the breaking of bread and to the prayers. And fear came upon every soul; and many wonders and signs were done through the apostles. And all who believed were together and had all things in common; and they sold their possessions and goods and distributed them to all, as any had need. And day by day, attending the temple together and breaking bread in their homes, they partook of food with glad and generous hearts, praising God and having favour with all the people. And the Lord added to their number day by day those who were being saved. Here we see our religious way of life, just a couple of weeks after Jesus had ascended into heaven! As Christians, we must be of one mind and one heart on our way to God. Take courage, reader, and ask yourself if this apostolic life is what God wants for you, too. An interesting note for pedants: Metz was the capital of the Duchy of Loraine (Lothringen), which was annexed by France on the eve of the Revolution. A large portion of the modern-day province of Lorraine was incorporated by the Prussians into a new German empire in 1871, restoring, it seemed, the territory (along with Alsace, which had been part of France for much longer) to its original German roots which had been severed only 95 years previously. After the Great War, these territories were restored to France, but, because they had not been part of the Republic during the Church-State separation in 1905, the relationship between the Church and State in these new territories were governed by the original Napoleonic concordat of 1801. This persists even to this day, and so the Bishop of Metz, Chrodegang’s successor, is not part of the French hierarchy, and is subject directly to the Holy See. Moreover, the Bishop himself is elected by the President (with the approval of the Holy See), and his clergy are given a state income, and Catholic religious instruction is given in public schools. The Canons Regular of Prémontré were founded by St. Norbert at Prémontré, France on Christmas Day, 1120. The Order arrived in England in 1138, until the suppression of the monasteries in the Reformation. By then, there were 38 houses (both male and female) in the British Isles. Expelled from these islands for over three centuries, we returned in 1872 and founded several missions. Our own canonry became independent in 2004, and we established our home in Chelmsford in 2006. Almighty Father, raise up abundant and holy vocations to the Order of Prémontré. Send us good and holy souls who will keep the Faith alive and guard the blessed memory of Our Holy Fathers Augustine and Norbert. Send us ardent yet gentle men who through the preaching of Christ’s word and the administration of the Sacraments may continually renew your faithful. Grant us holy ministers of your altar who will be careful and fervent guardians of the Eucharist; lifting high the Blessed Sacrament above all the errors and miseries of the world. Amen. Vivat Maria! Long Live Mary!